It’s amazing how one little sentence can spark an array of memories, twisting and weaving and exploding I would say all over my mind. Dal bhat, the traditional Nepalese post trek chow. Simple, not particularly elegant, but damn good grub. It’s good with a touch of spice. 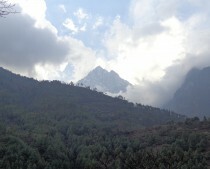 In about 3 months, I will finally be going back to Nepal. No matter what. And I guess, in that tentative way, I have finally allowed myself to believe it is happening. The Wild Medic Project are an Australian based company set up primarily for paramedics and nurses to provide basic health care to resource limited regions. Lucky for me, they have not only taken me on board (not a paramedic or a nurse) but have also decided to take their adventures to Nepal. On 25th April 2015, Nepal suffered a 7.8 magnitude earthquake with after shocks. 9000 people were killed, with many more still affected. I remember exactly where I was…at work. Doing a Special Care ward round, labouring over milk feeds, volumes, aspirates, how much oxygen this baby was in, whether that baby needed Gaviscon, the usual… BBC news flashed up a headline on my phone. Through the ward sister’s recriminations for carrying a mobile phone (it has a calculator, I need it) I read the news, slowly, sinking, clarifying. Does it matter? People are dying and we should be doing something. Period. It marked a turning point for me. An exit strategy. A reason to be. If you are a regular follower, you will know this journey started with Nepal. It started with a crazy dream, a mad notion, and a deep down sense of Ariel’s ‘I want more’. And it is that notion that carries me through. I am still hesitant to hope. I still feel it may not happen. So I will keep it at a minimum for now. But the pictures pop up on my Newsfeed. A year’s amnesty from Facebook broken, just to reconnect, to rejoin and renew my personal vows. I wonder what it will be like? I wonder what challenges I will face this time? I wonder how I will find it? I wonder how on earth to get my fitness up to scratch! !